The 2014 Football World Cup will be happening soon. Ahead of the Summer games, Samsung launched the Galaxy 11 Youtube viral video; to promote the Samsung Galaxy S5, which was released a month ago. The whole campaign is kind of like Space Jam, but with Football instead of Basketball. An Alien invasion is imminent, to counter the threat; Eleven Football players are selected from across the globe, and drafted into the Galaxy 11 Football team to fight them. The online viral video is about the training the players are put under, in preparation for the match against the invading Aliens. To clarify, this online viral video is an advert for Samsung’s Galaxy S5 and Gear and Fit products. This is not an advert for the World Cup or Football. However Samsung have decided to use Celebrity endorsement, to associate their brand and products with the game. The advert features World-class players such as: Cristiano Ronaldo, Lionel Messi, Wayne Rooney and many more. From the number of talented players involved; you get some idea of how much Samsung have invested into this campaign, and the worldwide-appeal each player will attract for them. As we all know, Football has a strong and wide following across the globe; celebrity endorsement of this magnitude, is just right for an international campaign. However the appeal of using Football players isn’t just for the global-reach they have, but the demographics they can appeal to. For example, the age demographic; in particularly young teenagers, who aspire to be Football players like Messi, Ronaldo and Rooney. They are at the age where they need a mobile phone, and parents willing to pay for them to have one. Let’s not forget that this is all just an advert; a small-part in a larger campaign for Samsung to sell their products. Let us look at how they have done this through the online viral video. Where do we even begin? 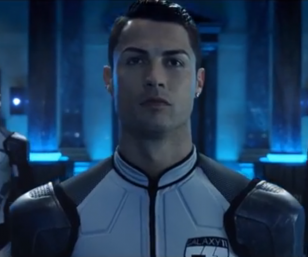 You have Aliens, alien spaceships and Tron-like suits which the players wear when they enter the training facility. Don’t even get me started on the facility; before they enter, there is a exposition shot of the the centre, which resembles some kind of Nasa-like base. On the inside, everything is very clinical and blue; with a Galaxy S5 which seems to be hovering on its base-unit. The computer screens the scientists use are thin glass-like monitors and is most probably a touch-screen device. The examples presented are just a small portion of what Sci-fi iconography can be found in the video. They have done quite a lot to make it look very futuristic and high-tech. Samsung have clearly spent a lot of money into this whole campaign, it is quite flawless visually. When the players start their training, they are playing against robots found in the facility. They have the Galaxy S5 and Gear and Fit attached to their suits, to monitor their heart-rate. You also see the players interacting with the devices at different points, naturally you’d expect the products to be featured in the ad. Besides the reach these players bring for the Samsung brand, it also connects them with a lifestyle choice that Samsung wants associated with their products. Naturally people will associate the phone with these players in some way because of the ad. In effect the ad is saying if you want to be like these Football players, then buy our products. With the high-quality visual effects and CGI, Samsung have clearly poured a lot into producing the campaign. Certainly well-spent, and added with the Celebrity endorsement from the Football players; you have a winning combination. It will be interesting to see what they will next add to the campaign; we probably won’t have to wait long with the World cup approaching in June.